Providing you the best range of corrugated board making plant, corrugated board double facer machine, fingerless single facer corrugation machine and mechanical shaftless mill roll stand with effective & timely delivery. We are engaged in manufacturing, exporting, supplying Corrugated Board Making Plant to the clients. 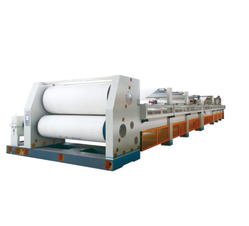 Corrugated Board Double Facer Machine functions securely and reliably, processing all board grades and qualities from micro-flute to heavy triple-wall corrugated cardboard. Thanks to the use of unique and state-of-the-art heating and pressure systems, such as thin peripherally drilled hot plates and the patented Platetrol pressure system, Our Double Facers are perfectly suited for processing the full range of corrugated board production requirements. These and other design features also ensure that the DF-P Double Facer delivers a quality board with the highest possible energy efficiency. 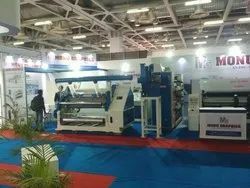 The glue application unit of the corrugated paper twin facer comes with a block design, a variable frequency drive, straight-line guideway, and hydraulic lock. It can achieve pneumatic control of the movement of the glue trough and electric control of glue application. The twin facer is also equipped with a spraying device. The heating plate is surface ground and chrome-plated. Dense weight rollers are used in the heating section, 3-stage adjustable pressure for weight rollers are controlled by the pneumatic system according to thickness of paperboard. 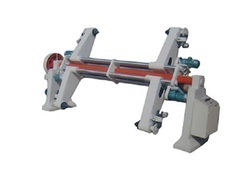 (optional) Tension control for upper cotton belt by pneumatic cylinder. Automatic or manual correcting device are optional. Drive section adopt gear box, drived by electromagnetic speed control motor or frequency conversion motor. Driver rollers be covered endure abrasion rubber, and cutting form teeth, with drum and put out paperboard stable. 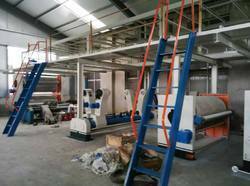 CLASSIC, Finger Less Single Facer Corrugation Machine with all Accessories.